The City of Chandler was founded in 1912 and has expanded its diverse population from 9,531 in 1960 to 251,163 in February 2017. In addition to Chandler being ranked as one of the best cities to live in, satellite locations for many technology companies including Intel, Orbital ATK, Honeywell, Microchip and many more have found their home in Chandler. The rapid growth of Chandler has sparked major investments into downtown infrastructure which includes award winning restaurants, bars, entertainment and shopping. The city of Chandler is actively involved in a variety of community activities such as seasonal festivals and access to many recreational, fitness, cultural, artistic and educational programs. Chandler’s regional Tumbleweed Park hosts various events throughout the year such as the annual Ostrich Festival, Jazz Festival, the Fourth of July Fireworks Festival, Day of Play, and my personal favorite – The Annual Food Truck Festival. Chandler Unified School District is consistently recognized as one of the top School districts in Arizona which includes A+ Schools of Excellence and National Blue Ribbon Awards. 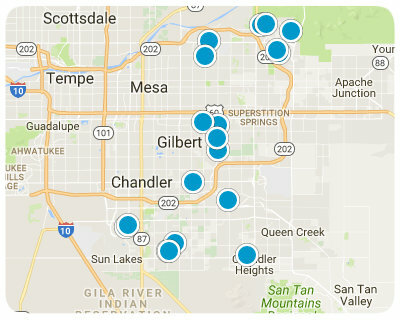 Below are ALL of the Homes for Sale and Recently Sold in Chandler AZ from our Realtor MLS UPDATED EVERY 5 Minutes! That means EVERY home from EVERY Real Estate Company that is currently for Sale. You can also view ALL Homes for Sale in Chandler, Chandler Condos, Chandler Foreclosures, Chandler Short Sales, Chandler Townhomes and Luxury homes in Chandler. You can filter your search at the top by price, size, etc. Check out the popular 1-Click searches like Chandler Homes for Sale with a Pool or Horse Property for Sale in Chandler Arizona.